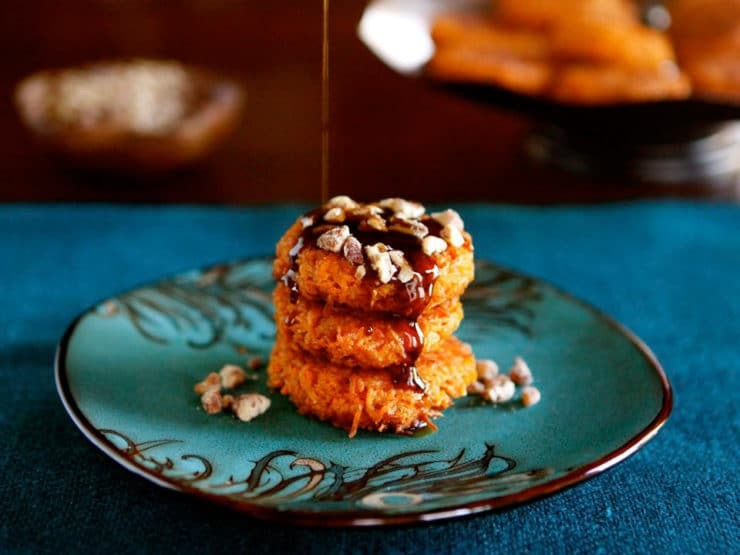 Sweet Potato Latkes – savory or sweet with Brown Sugar Syrup and Cayenne Candied Pecans. Perfect for Thanksgiving or Hanukkah. During Hanukkah, it is Jewish tradition to eat food that is deep fried in oil, a tasty and caloric reminder of the Holy Temple miracle (learn more here). Once a year, we are given guilt-free rein to enjoy fried foods like latkes. Of course, Thanksgiving has its own go-to traditional foods. With Thanksgiving and Hanukkah in close proximity to each other, it seemed only natural to develop a killer Sweet Potato Latke recipe. I prefer my latkes savory and salty, but Thanksgiving tradition calls for a sweeter version. The good news is, these latkes can go both ways. Prepare them as written and sprinkle with salt for a crispy treat that veers toward savory; the latkes will have a bit of natural sweetness from the potato, nicely balanced by cinnamon, salt and a touch of curry. 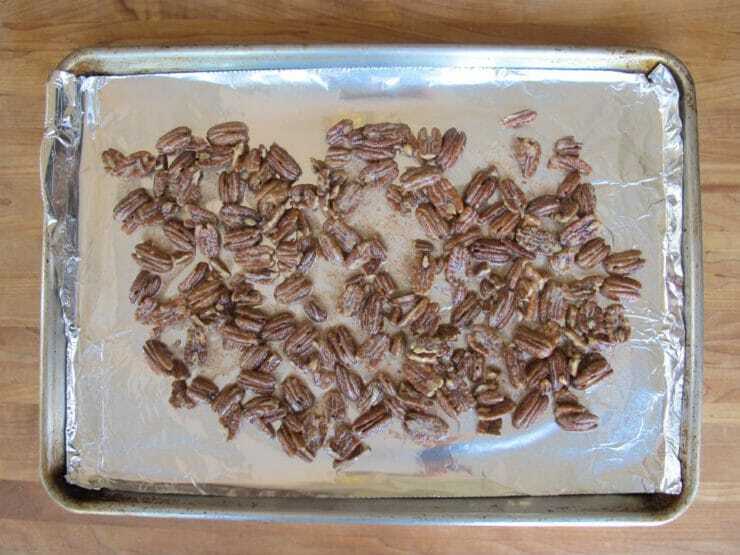 If you’re craving a sweet dish, drizzle them with a simple brown sugar syrup and sprinkle with cayenne candied pecans (recipes below). Prepare to swoon. Even though I like my latkes savory, I couldn’t get enough of the sweeter variation on this recipe. The candied nuts have a touch of heat, and the syrup brings out the spices in the latkes. It’s a really special flavor combination. Sweet Potato Latkes - savory or sweet with Brown Sugar Syrup and Cayenne Candied Pecans. Perfect for Thanksgiving or Hanukkah. Before you begin making the latkes, place your wire cooling rack or a sheet tray lined with paper towels close to the area where you will be frying the latkes. Peel the potatoes, then grate them using a hand grater or food processor shredding attachment with fine holes (small shreds). I really recommend using the food processor, it saves a ton of time. 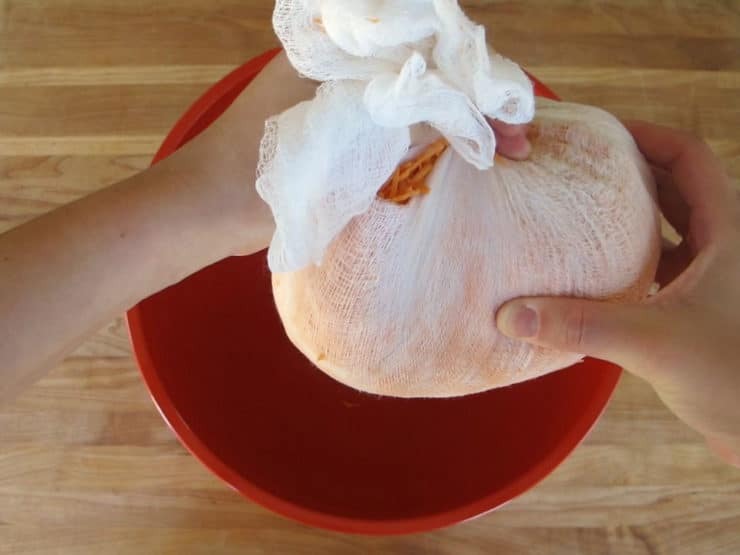 Place potato shreds in the center of a clean tea towel or multiple layers of cheesecloth. Wrap the shreds up in the cloth, twisting the cloth to secure the bundle, and squeeze firmly to remove excess liquid from the shreds. Pour potato into the clean, dry bowl. While oil is heating, stir the breadcrumbs, beaten eggs, potato starch, salt, cinnamon and curry powder into the potato shreds. Take care to make sure the egg and seasonings are fully mixed throughout the potato shreds. Let the mixture rest for 10-15 minutes. 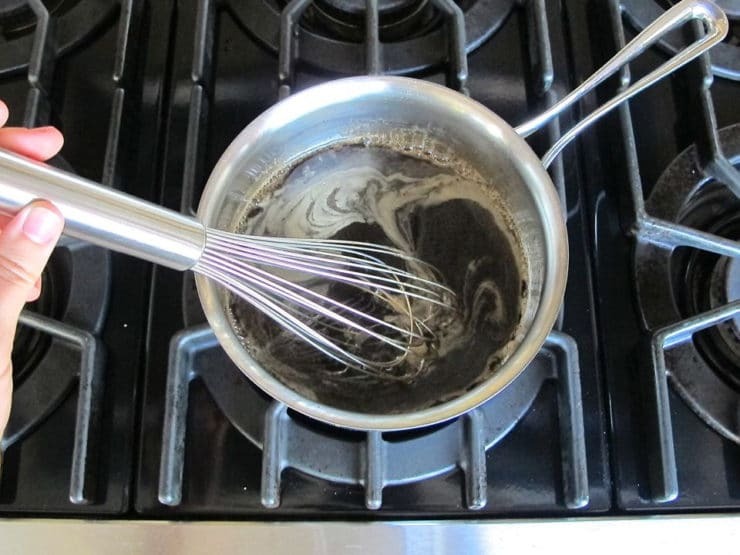 Pour oil into skillet to a depth of 1/8 inch. Heat slowly over medium to about 365 degrees F.
Scoop up 4 tablespoons of the potato mixture. I do this by using a 1/4 cup measuring cup. Squeeze the mixture firmly in your palm over an empty dish to remove any excess liquid (if you squeezed the potatoes out thoroughly in the cloth, you may not have much excess liquid to squeeze out). 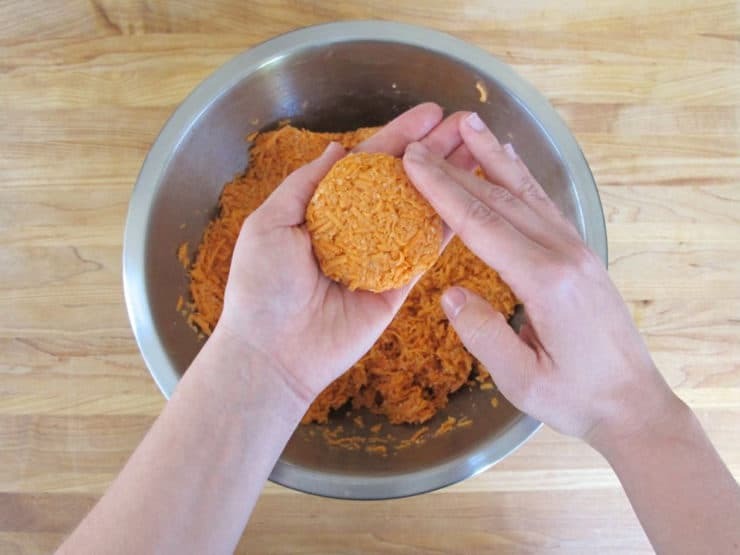 Shape the potato mixture into a tightly compacted disk. Place the disk carefully into the hot oil. Latkes can break apart at this point, they're very delicate. If you can get them into the hot oil in one piece, chances are they will stick together--frying them is like the "glue" that holds them together. 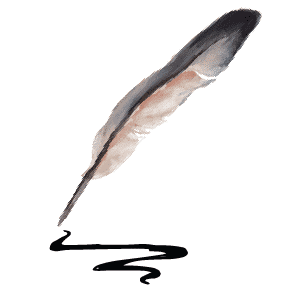 It takes a gentle touch, and it may take you some practice to get the "feel" for it. The oil should sizzle but not pop when the latke hits it; if the oil jumps wildly or smokes, it is too hot. If it only bubbles weakly, the oil is not hot enough. Use the first latke to test the oil temperature, and don't fry a whole batch until the temperature is right. Continue shaping the latkes in this way, using 4 tablespoons of potato mixture for each latke. Fry in a few separate batches, but be sure not to crowd the pan, for 2-3 minutes per side till brown and crispy. Note: If your latkes aren't holding together, stir more potato starch into the mixture, 2 teaspoons at a time, till the batter "holds." 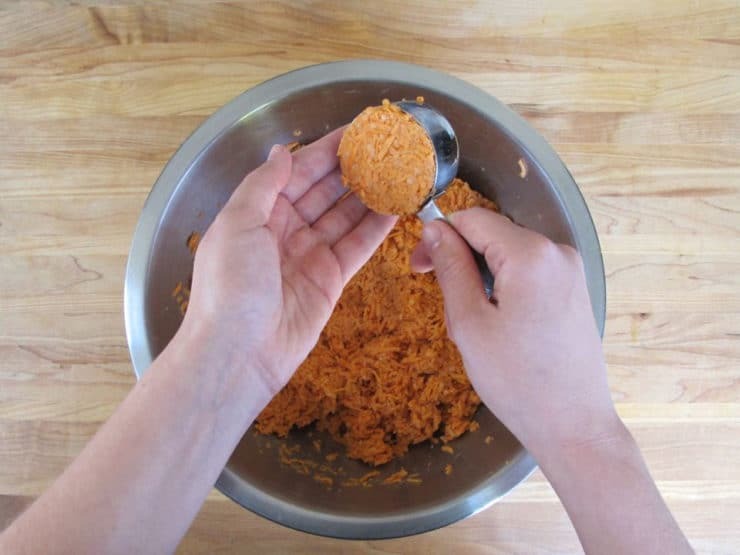 You can also add another egg to the mixture and more panko, if needed. Remove the latkes from the pan using metal spatula and place them on a wire cooling rack or a sheet tray lined with paper towels to drain (I prefer a wire cooling rack, which helps to keep them more crisp). I recommend serving latkes fresh within 10 minutes of frying them, if your cooking schedule permits. If you need to make them ahead, fry them 4 hours or less before serving. After letting the latkes drain on the wire cooling rack, place them on an ungreased, unlined cookie sheet. Leave them at room temperature till ready to reheat. Place in a 375 degree oven for about 10 minutes (7 if using a convection oven), until heated through, just prior to serving. Serve latkes sprinkled with sea salt to keep them more savory, or drizzle with Brown Sugar Syrup and Cayenne Candied Pecans for a sweeter treat. 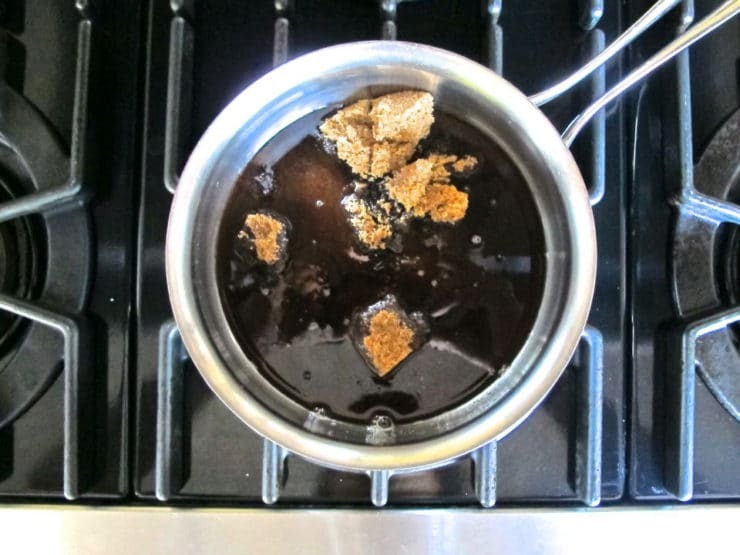 In a small saucepan, combine brown sugar, water and salt. Bring mixture a boil, whisking regularly. 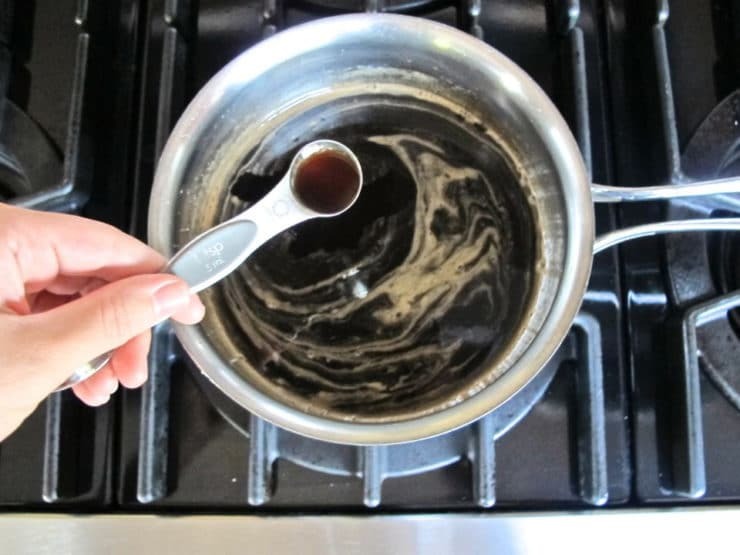 Remove saucepan from heat and stir in 1 tsp vanilla. Preheat oven to 300 degrees. 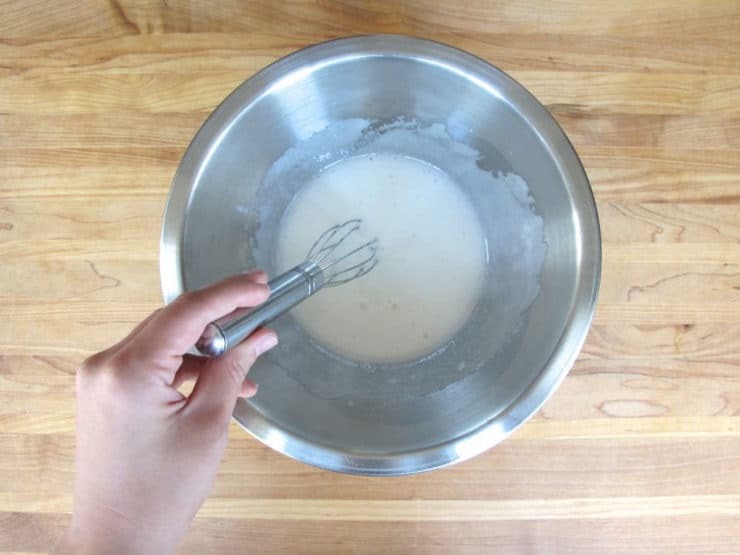 In a mixing bowl, whisk together the egg white, water, sugar and salt until foamy. Add nuts and toss to evenly coat. Add spices and toss again. 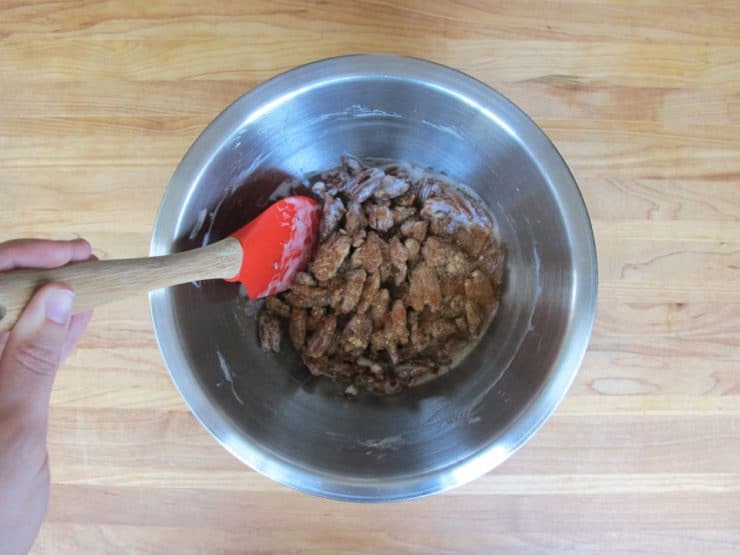 Remove nuts from bowl using a slotted spoon and spread them evenly on a sheet tray lined with foil or a silicone baking sheet. Bake for 15 – 20 minutes, or until browned. 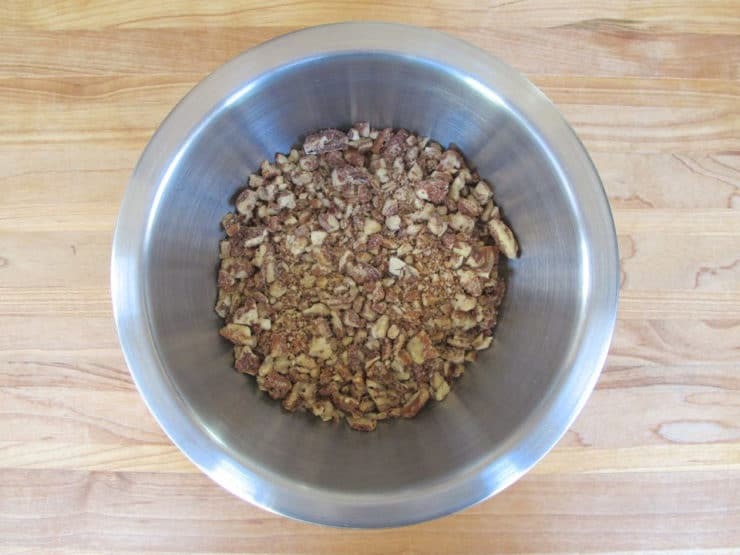 Once cool, pulse the nuts in a food processor until they are roughly chopped. This can also be done by chopping them with a knife. They can be served whole if you prefer. 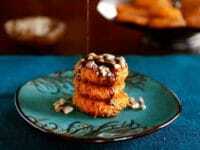 Drizzle the sweet potato latkes lightly with brown sugar syrup and sprinkle with the cayenne candied nuts, if desired. Serve. These look delicious. Has anyone had any luck making them ahead and freezing? THANK YOU Tori! I had a Chanukah party last night and your latkes were a big hit. They were the best I ever made; so delicious! ? This dish looks absolutely delectable. Brown sugar syrup with a latke. Never would I have thought of that. What a great find! I have bigger problems, I have a special little boy that cannot eat any eggs, he is big time allergic, any suggestions for either sweet potato or potatoe or ” minute” rice latkas I can make him. Could really use some help here. I am also very bad when it comes to computers, e mails work great. Instead of squeezing the water out of the potatos. Why not simply add potato flour until the desired consistency is achieved? 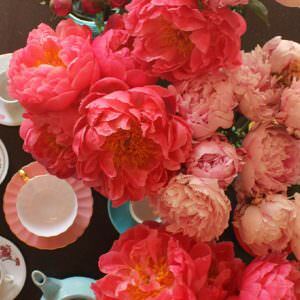 It will save tons of time and mess and, …. I dare someone to tell the difference. Adding potato flour to wet shreds leads to gummy latkes, in my experience. I prefer drier shreds personally, they fry up more crisp. I use a different sweet potato recipe, but will try this one next year. 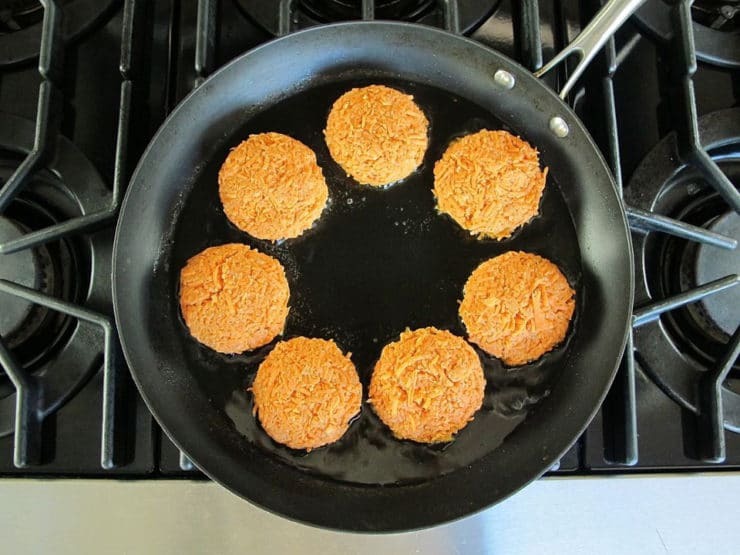 I use your Panko Latke recipe and love it! 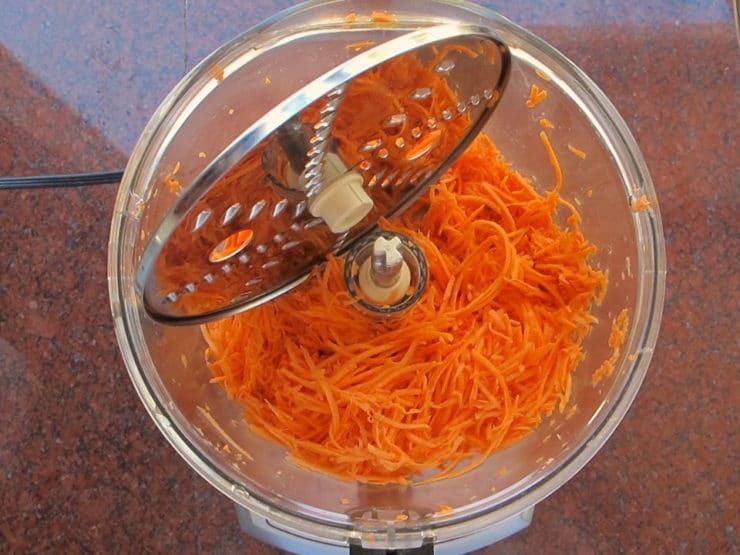 One question: your photo of the grated sweet potatoes looks like you are using a Cuisinart Elite 14 Cup processor, since I see the finger holes in the disc. I have had a ton of problems with mine grating carrots, etc. because large chunks fall thru the holes. Any suggestions? I looked for a non-Cuisinart replacement disc (that might not have the holes), no luck. Thanks again, Tori, for a wonderful web site! And Hag Sameach! Hi Ed, yes I have that problem too… a few chunks always fall through. I just fish the chunks out and mince them up, then add them back to the shreds. It still takes less time than hand grating them all. I do agree it’s a bit of a design flaw, I’m not sure how to correct it. Made these for thanksgivukkah…AMAZING! we omitted the cayenne pepper in the pecans and added allspice instead and it was amazing! We made these and they were incredible. Thank you! Happy to hear that Jenn! made these for thanksgivukkah with a couple of changes. 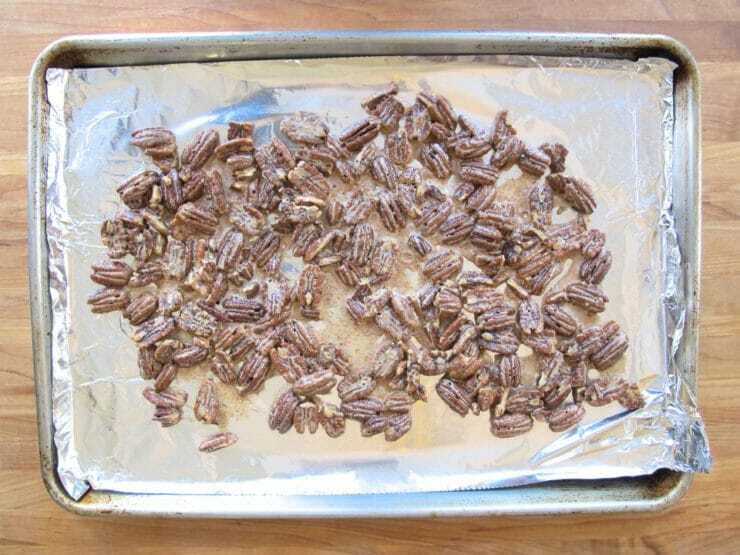 Can you make the pecans and the brown sugar syrup the day before? Will they hold? Yes Taylor. Keep the syrup refrigerated and reheat before serving. Looks delicious! I am going to try to make these tomorrow! I did make the sweet potato latkes, they came out great and were a big hit! Great Steve, thanks for writing! Have you ever tried the sweet potato latkes baked? What about gluten free? If so, what flour would you substitute? Is there any substitute for the bread crumbs if you have a friend who is gluten free? I have a friend who is allergic to wheat, and is very excited about this coming Thanksgivmakkuh, and I would like to help him realize a latke’s full potential for satisfaction on this special day. You’re my go-to! Help! I’m with you on savory latkes, I make parmesan garlic zucchini latkes every fall until I run out of zucchini. I make sweet latkes for my family, their favorite combination is sweet potato, carrot, apple seasoned with cinnamon and brown sugar. I’m going to have to try your recipe this year, the syrup and candied nuts look great! For this recipe, I had a little trouble finding potato starch this time of year. I did end up finding a box, but was curious – if I could not locate it, could corn starch have been substituted? Hi Miriam, you can actually omit the starch if you can’t find it, it’s only there to help hold the latkes together a little better. It’s helpful but not necessary. Latkes. If possible can canned Pumpkin puree be used? And, number 2 Question: I do not know anything about Grape Seed Oil. I do not use Peanut oil and I want to use the Grape Seed Oil but, I know nothing about its properties. best ‘quality’ brand to pruchase. Hi Geoffrey! You are very kind. 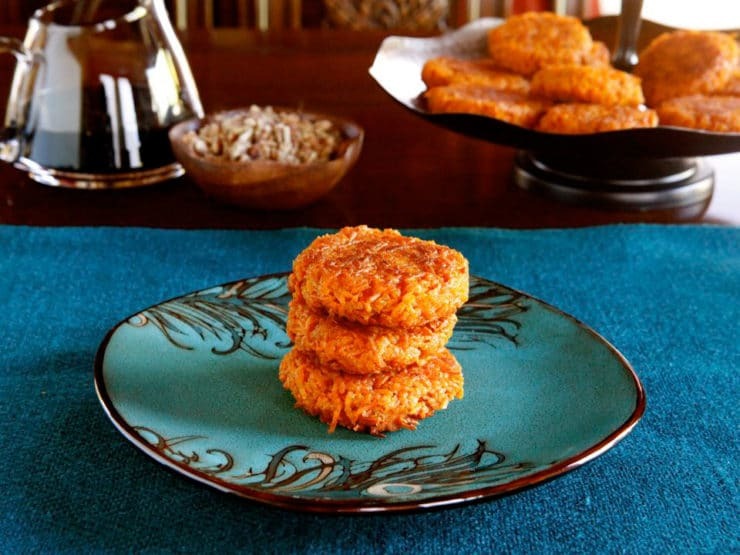 I would not use pumpkin puree for this particular Sweet Potato Latkes recipe. You could, however, substitute it in the recipe at this link: http://theshiksa.com/2010/11/24/sweet-potato-and-coconut-chremslach/ You may need more breadcrumbs and egg to bind it together though, pumpkin is quite soft. Keep in mind that the pancakes won’t be very crispy if you use pumpkin. Regarding Question #2, grape seed oil is terrific! It has a very high smoke point (meaning you can fry without worrying about creating smoke), and it has no cholesterol. I sell it in my online market here: https://theshiksa.com/market/fine-foods/pantry-essentials/mantova-grapeseed-oil/ however it only comes in packs of 4, so if you’re just trying it you may want to pick up a bottle from your local grocery store and try it first. I love the recipes and the pictures!!! Can we bake the latkes at a high temperature, around 400-450 instead of frying? Had anyone tried that? Hi Fran– I do not recommend baking latkes, they never come out as tasty as they do from the frying pan (and we tend to save them as a treat just a few times a year, so we prefer them fried). That said, many people do it to save on calories. If any other readers have suggestions on baking please feel free to chime in. Tori, what’s the approximate yield for ths recipe? Thanks! Hi Sue, it makes about 16 latkes. Enjoy! I made those wonderful latkes for Shabbat last Friday, they come out wonderful, everyone enjoyed it! Fabulous Carmen! So happy to hear that! 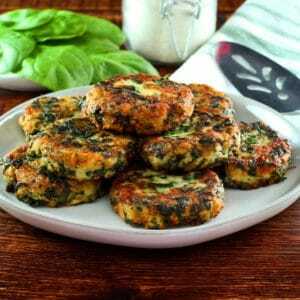 Barbara, you really should try using zucchini or yellow summer squash in place of potatoes, it´s so yummy!! love latkes, I call them potato pancakes. never had this version before, but looks and sounds really good. Is there something else I can use besides potato starch. My granddaughter is allergic to it. Thank you! Shannon, try making them without the starch first. If they are not holding together well (the starch helps to bind them), try adding another egg and more breadcrumbs, then letting the mixture rest for 10 minutes before trying again. Enjoy! I must make these. These look delicious! I love this sweet rendition on potato latkes. I’ll definitely be adding these to our menu this year! Your recipes are amazing. I cannot wait to try them out at home! Iamke some pretty good potato latkes, so will have to give these a try. Oh my goodness. This is amazing! I use Yukon Gold–Canadian variety, and make them traditionally for Chanuka (without flour for gluten free) and call them silver dollars. I’m such a sucker for Latkes, the crispy exterior and soft interior. I order them almost every time that we visit a Jewish deli, but our deli’s are not serving these yummies up! Loooving the syrup and nuts along side. I make sweet potato latkes every year. After root vegetable latkes, they´re my favorite. They´re the best way to combine Hannukah and Thanksgiving. These sound like a wonderful a wonderful side dish to go with Thanksgiving dinner. Am most anxious to try. Thanks! A good recipe. It you Americans sure like your sugar. LOVE this combo!! I made sweet potato latkes as well but with an apple beet salsa…i am soo making the brown sugar syrup asap! Certainly sounds wonderful but could it possibly be sacrilegious???? I could easily be a fallen woman. 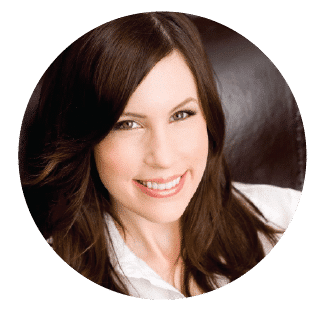 Tori – do you have a cookbook yet or are you planning to put one out with all your recipes posted online??? I´m still upset that Berger King took away my sweet potato fries – but love sweet ´taters in any form!!! Donna Waltman, I think we would like these, don´t you? Potato& grated Zucchini together is delish! Hi Tori! I made Potatoe latkes and grated onion and peeled Zucchini delish! And served them w applesauce and sour cream too! Try a combination of sweet and Irish potatoes. So good! Oh my goodness does that ever look super delicious!!!! Interesting… And a beautiful presentation! It´s next month when the pecans here in North Texas start to fall. Pecan trees only really produce every other year; and it´s sad to say, lots of people think of picking them up and shelling them as more trouble than it´s worth. 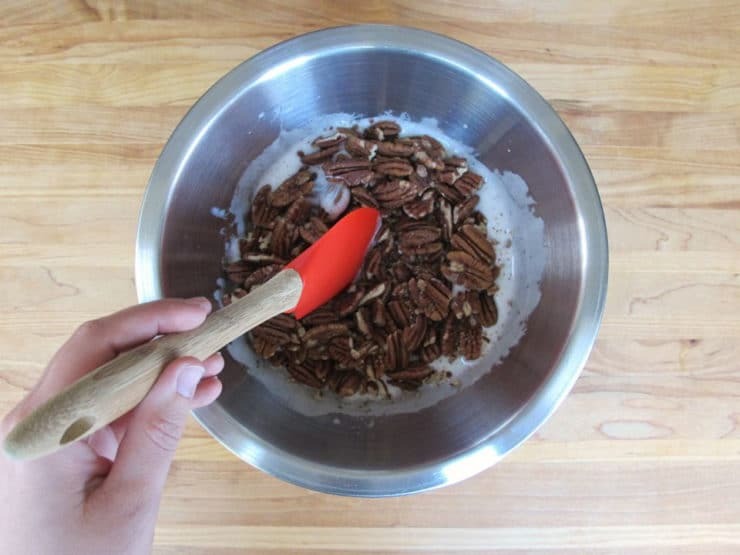 Me…I shell pecans. I find wild pecan trees alongside roads nearby, and I mark them in my mind. I´m looking forward to November and my Texas pecans. 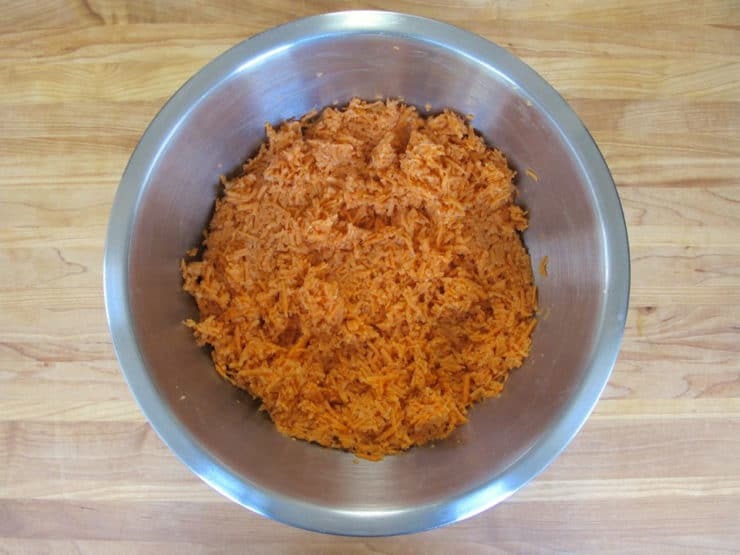 I am in the process of creating some sweet potato latkes myself ! Goodness , gracious, sake´s alive !